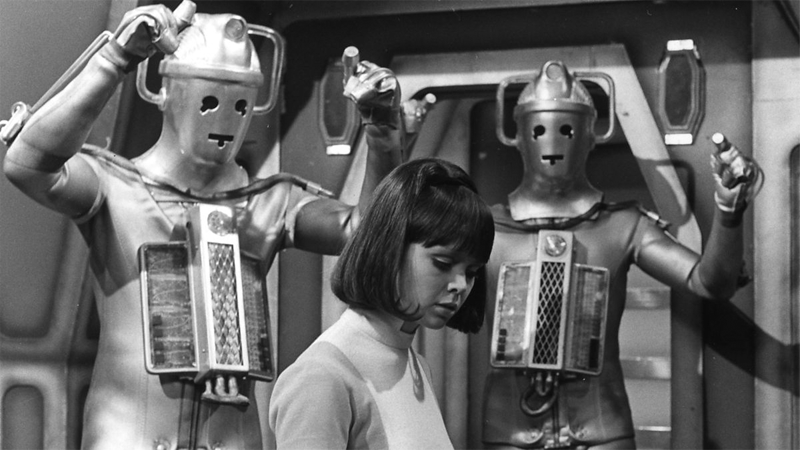 The Cybermen prepare to menace poor Zoe in her debut story. So much of Doctor Who’s early past is lost to time—not in the romantic, time-travel sense, but in that old BBC archival policies meant that the original records of the earliest years of Who in the ‘60s were wiped, leaving nearly 100 episodes seemingly gone forever. But one tiny slice of vintage Who is getting a revival next month. Only two of the six episodes that make up “Wheel”—a Cyberman story that introduced the second Doctor companion Zoe Heriot, played by Wendy Padbury—currently exist in the BBC’s archives. But for the first time, a 10-minute slice from the first episode (which is still missing) is being prepared for a screening at the British Film Institute in London next month as part of the BFI’s “Missing Believed Wiped” programming, a regular event examining the history of missing TV in the UK and the efforts being made to bring parts of British media history back to life. The sequence will eventually be included as part of a BBC DVD release in the future—just as this small snippet, according to Rob Ritchie, one of the team who worked on the animation, rather than as part of a wider attempt to restore “The Wheel in Space” through animation. But for now, another missing slice of Doctor Who history is getting a bit of a regeneration. Two previously lost Doctor Who episodes come out this week!